Hi. 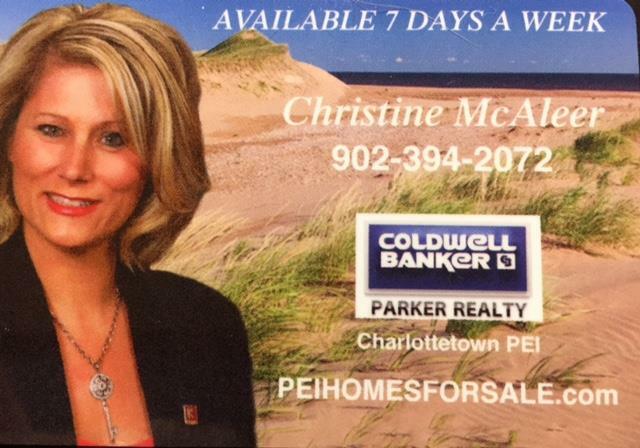 I'm Christine McAleer, Realtor with Coldwell Banker Parker Realty. I was raised on a dairy farm on Prince Edward Island and moved to the United States in my twenties and work with an Organic Fertilizer Company. When I returned to the PEI, I fell in love with the Island all over again, with a new appreciation for its natural beauty. Being a licensed Realtor, I now have the privilege to show this beautiful Island to others. With my desire and passion for Real Estate, I quickly learned and have a great understanding of property values in todays market. I enjoy working with clients, dedicating my time and experience to getting the results that my client's want. I will help you with every aspect of buying or selling your home, land, building lots and business! I'm experienced professional, ready to work hard for you!